Italian bloodlines run deep in Australia and Asia. In recent years, ballplayers of Italian descent have been making their impressions felt in the Australian Baseball League and in Japan’s Nippon Professional Baseball League. 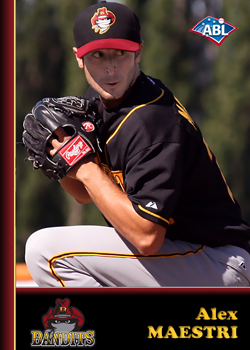 Alex Maestri–a Cesena, Emilia-Romagna native and former Chicago Cubs prospect–served as the ace of the Brisbane Bandits pitching staff during the 2011-12 Australian Baseball League season. He finished third in the ABL in innings pitched (63.2) and in strikeouts (53). With an impressive ERA (3.25) and WHIP (1.16), the first Italian-born pitcher ever signed by an MLB franchise also led the Bandits in wins (4). After a very successful stint in Australia, Maestri was recruited by the Kagawa Olive Guyners in Japan’s Independent League. 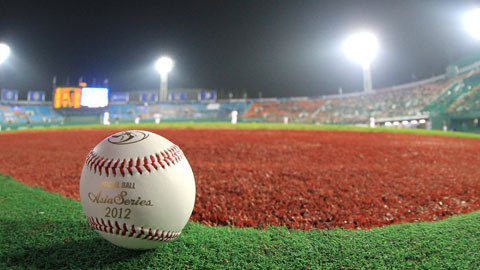 Maestri dominated hitters and soon moved up the ladder to face the game’s elite in the Nippon Professional Baseball League when he was signed by the Orix Buffaloes. Maestri still continues to enjoy success in Japan. Italian American infielder Adam Buschini was signed by the San Diego Padres after winning the 2013 ABL Triple Crown title. 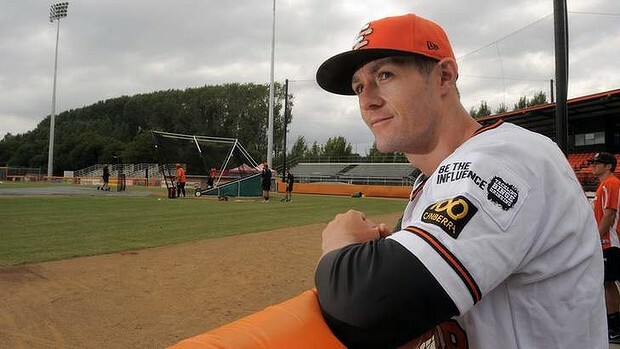 Adam Buschini was awarded the first-ever ABL Triple Crown for his heroic 2012-13 ABL regular season. The Triple Crown–awarded to a player who has the highest batting average, the most home runs and driven in the most runs in a season–is one of the game’s rarities. The Triple Crown has only been achieved 16 times in over 130 years of MLB history. The Northern California Italian American slugger claimed the ABL Triple Crown with a .363 batting average, a league record-tying 15 homers, and an ABL record-breaking 50 RBI in just 45 games. He was named ABL Player of the Week twice. In ABL Round 10 action, Buschini went 8-for-17 (.471) with a double, three home runs and 9 RBI. 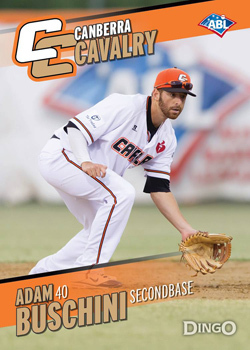 He exploded in ABL Round 13 when he went 9-for-15 (.600) with four homers and 9 RBI to help the Canberra Cavalry claim the top playoff spot and eventually win the ABL Championship. Adam Buschini’s success continued as he led the Padres AA affiliate San Antonio Missions to a 2013 Texas League Championship. Canberra’s new pitching coach Hayden Beard is delighted to have Nick Pugliese in the Cavalry bullpen. 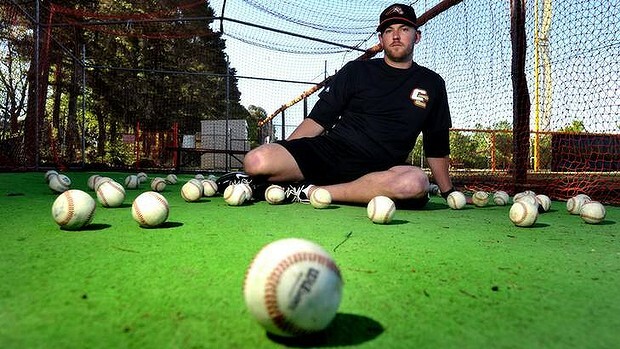 Hayden “Big Dog” Beard, a member of the 2012 San Antonio Missions and local resident mentor of the Canberra Cavalry pitching staff, now serves as pitching coach for the 2013-14 Canberra Cavalry. With over four years of experience in the Mets and Padres organizations, Beard knows talent when he sees it. The Big Dog is thrilled to have Nick Pugliese on the team roster after watching the former LA Angels prospect pitch for Team Italia in the 2013 World Baseball Classic as well as his stellar ABL debut performance. 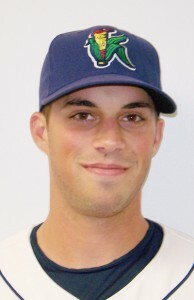 Nick Pugliese in 2009 after being signed by the Los Angeles Angels. “It was good to get Nick in there during the first game of the year and get him a feel for the league,” said Beard. “He had a solid outing punching out two without yielding a hit. He threw both his sinker and slider for strikes from different arm angles with good life on his pitches. We project him as a back end of the bullpen arm at the moment.” Pugliese did not disappoint in his second ABL lights out appearance. 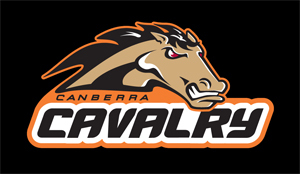 Canberra Cavalry will represent the ABL in the Asia Series beginning November 15. 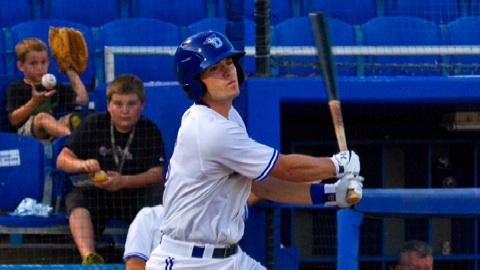 Despite the loss of Pugliese’s services in the Asia Series, the Cavalry charge abroad will be mighty indeed with the addition of Toronto Blue Jays prospect Jon Berti–who he led the Single-A Advanced Florida State League in games played (128), at-bats (505), runs (85), hits (126), triples (5), walks (57), and stolen bases (56). Replacing Adam Buschini at second base, Berti is up for the challenge. 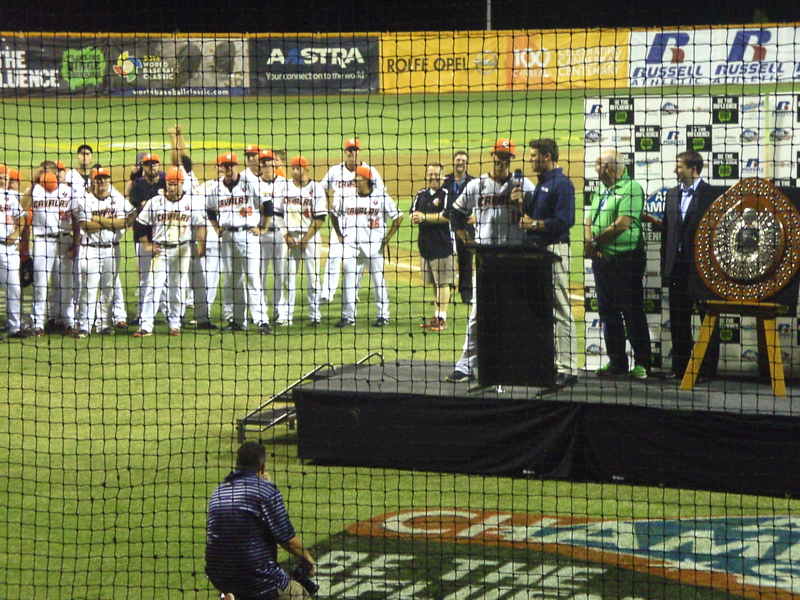 Michael Collins accepts the prized Claxton Shield after winning the 2013 ABL Championship.